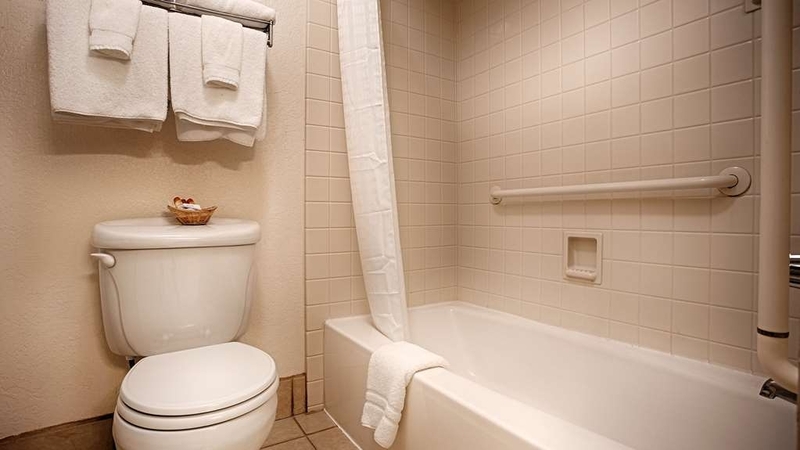 The Best Western Sandman Motel is ideally located in the center of Sacramento. Come and experience our hotel near the major tourist attractions. Best price guaranteed and exclusive deals. 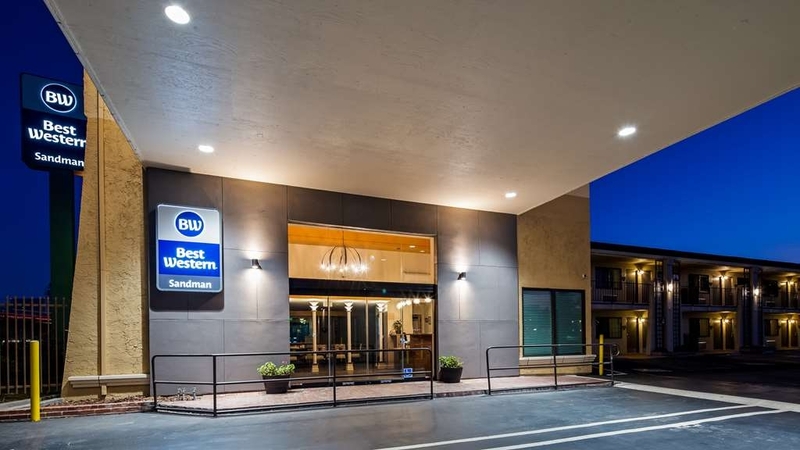 There's no easier way to experience Sacramento than at the Best Western Sandman Motel, an award winning facility just minutes from top attractions. 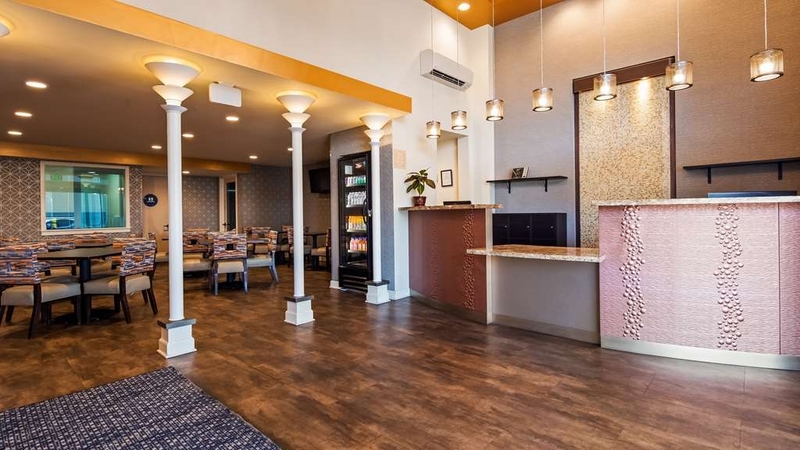 With easy freeway access, this conveniently located Sacramento hotel is only one mile from Old Sacramento, where visitors can take advantage of modern shops and restaurants, while also taking in the area's historic vibe. Fascinating museums like the California State Railroad Museum take visitors back in time to the days of the California Gold Rush. The beautiful California State Capitol building, where California's past, present and future comes together, is just another mile down the road. Sutter's Fort State Historical Park, the California Exposition Center, the Sacramento Convention Center and Arco Arena are all just a short drive away. 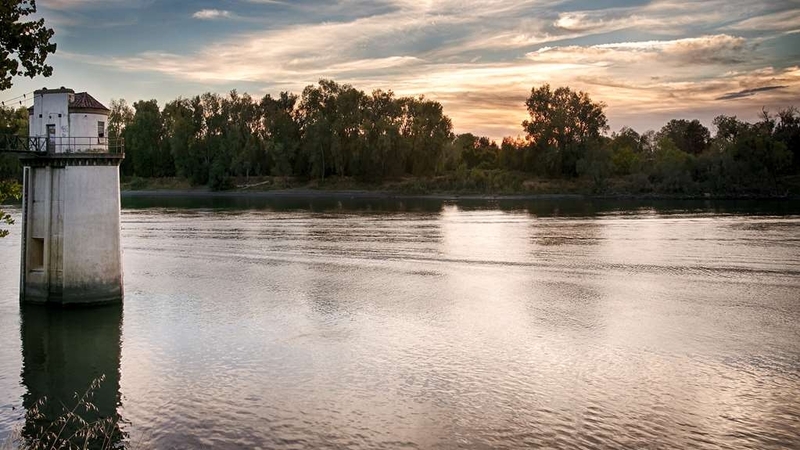 The Best Western Sandman Motel is the only hotel with private guest key access to the Sacramento River, offering adventurous guests opportunities for boating, fishing and easy access to Old Sacramento. There's a reason this Sacramento hotel received the Best Western Director's Award for Outstanding Quality Assurance three years in a row. The property offers well-appointed guest rooms, each featuring cable satellite television with HBO® and high-speed Internet access. Guests will enjoy an array of amenities, such as a complimentary full breakfast, a heated outdoor swimming pool & hot tub, limited business services and our onsite restaurant, Nena’s Mexican Restaurant. We have shuttle service to the Sacramento International Airport, Amtrak, Convention Center and Old Sacramento. Our helpful staff at the Best Western Sandman Motel is here to help make your stay in Sacramento, California as memorable as possible. Make a reservation today and save! Hotel staff was very friendly. Room was nice and clean. I stay here every time I go to Sacramento. The breakfast items were decent. The bed was comfortable. I have a bad back and the beds here do not bother my back. Pillows were nice and fluffy. Mexican restaurant next door. Not far from the Sacramento River. Great for a nice evening stroll. I certainly don't recommend the breakfast. The beds are older. I suggest getting a room on the west side of the building. It's quieter and the sun doesn't shine through the window in the morning.The Mexican restaurant in front of the motel is very good. "Probably won't stay here again"
We have stayed at this BW several times but this time the office staff were abrupt and there were many "ladies" loitering outside of our room. It did not make us feel safe at all. We will probably not stay there again. It only about 3 minutes to have the registration process done. The breakfast was great and the staff at the reception were very helpful. I would urge anyone to stay at this hotel!!! The room is fully equipped with the fridge and microwave and that is quite convenient. I didn't like being checked in by a 10 year old girl. Also, my room was more expense than what was listed on Google. The hotel needs to be updated. However, the room was clean and the bed was comfortable. "Very Good but unfriendly check-in"
Although the hotel looks a bit dated from the outside, the rooms are very nice and clean and large. The pool is clean but looks out to the parking lot. They could block the parking lot view a bit to make it a better experience. The check-in lady was unfriendly and did not explain anything nor did she show us where coffee and water was available. We did not feel welcome. The other service staff was very good. The Sacramento river behind the hotel is a very scary place to walk. The office attended told us we could walk to old town from there but after about 1/4 of a mile we turned around and headed back. There was trash everywhere and homeless people sleeping by the walk way. There were people who looked like they were on Crack staring at us as if we didn't belong, obviously they were right!! This is right behind the hotel!! very clean, friendly staff, nice walking to old sac and the parks along the American River. Came for the fair but enjoyed surrounding area better. Pool and spa were clean, towels offered, was quiet and peaceful. Would def stay again if I return to sacramento! The staff was very helpful and took care of all of our needs.This hotel is in a great location.Down town Sacramento is within walking distance as well as Old Sacramento,and the great eating establishments of Old Sacramento.You can also walk to the Rail Road Museum and the bicycle is right behind the hotel.The river is located there as well. I hate to bash a place, but we agreed that it warranted it. Let me present a balanced review: The good: We got a room off Interstate 5, it was last minute and for $150 (with a pet). Exhausted from driving, we ate at the Mexican place next door and it was awesome. Room was about as clean as could be expected, staff was nice. We got to bed early as we wanted to be "hunkered down" before dark. Now, The bad: Truckers and trucks galore in the complex, "young people" hanging out (in and out to the icky river access out the back, wobbling on some substance, and women sitting in the parking lot, etc...) so, you get the idea. The "hot" breakfast was a joke as advertised. Bottom-line: Best Western needs to evaluate their franchise at this location. There has to be MINIMAL standards and I doubt that this would past the test. "Perfect for 4th of July and fishing"
I really enjoyed the stay. My family and were just there planning on going to watch fireworks. It worked out great...then we got the chance to go fishing. The place fit our needs including, having the internet for the kids to play their games on. The internet was pretty fast also. Couldn't have asked for a better 4th of July. We enjoyed the beautiful fire works, the comfort of a nice cozy room and comfortable bed while enjoy the Sacramento river during the day and Bbq. The best part of it all was we never used our car to go any place everything was a just short walk. This hotel is simple, clean, and affordable. They serve a decent breakfast, and have a small pool, fitness center, and guest laundry. Each room has a microwave oven, refrigerator, and coffee maker. Nearby freeway access, river walk, and close to downtown. There is a gas station across the street, and a Mexican Restaurant next door. The Zoo, William Land Park (golf and water play), and Fairy Tale Town are a ten to fifteen minute drive away. It's everything you would expect from a budget hotel. The rooms are comfortable and clean. There are some extras like a mini fridge and a microwave in the room. The best feature is that it's right on the American River - literally steps away. Has a nice pool, hot tub and workout room. Free breakfast in the morning and free Wi-Fi. Would definitely recommend staying here if you are shopping for a budget hotel. "Nice Spot for A Night or Two"
On a road trip and needed a mid point to stay the night. We were pleased with this property as it offered a decent room for five of us and was reasonably priced. Location was good as it's quite close to the American River and also has good freeway access. There was also a very nice Mexican Restaurant smack dab on the edge of the property that we enjoyed a lot. Do be aware that a walk to the river is quite easily done, but you may have to do some bobbing and weaving around some rather aggressive homeless people. Nice, clean hotel. Close to downtown Sacramento. Walking distance to Old Town. The pool is a little small. Free breakfast has a good variety of items, and there were plenty of places to sit so we didn't have to take the breakfast back to our room. Everyone was very nice and helpful. "Great place to stay in Sacramento"
I would definitely recommend this hotel. The breakfast was excellent with a wide variety of items. This was my first experience using a pet friendly hotel. The extra pet charge was minimal.The designated pet area was a plus. The fitness center was clean and also a plus. "Horrible customer service, and fire code violations." I was literally harassed after I let the establishment know they were not ADA compliant. I also believe I had property stolen from my room. I left for two hours and when I came back my key wouldn't work and a Samsung Tablet was missing. Check-in terrible; hot breakfast was COLD; cold eggs, cold sausage, cold undercooked bacon, toaster didn't work, small yogurts in refrig and sealed - yahoo! Checked out but would not fill my thermos with water - I had checked out!!! "Nice stay in above average motel"
We stayed here for about a week. The motel is clean, and the offered breakfast is very diverse. Aso the personnel is very friendly. We got one of the the only rooms without a "view", as our window was directed at an outside corridor. Pluses: Clean, standard amenities, nice pool area, well maintained, good breakfast, nice laundry facilities, very green location next to the Sacramento River, close to center (even by foot only a 15 minute walk to Old Sacramento) Minuses: Pool area was being painted during our stay, so it could not be used all the time. The key cards kept on being demagnetized, and wouldn't work anymore within a day of receiving a new one, even after following the instructions on how to protect de card. This is not the best place I have ever stayed, but it was for sure good enough to satisfy my expectations. I would come here again. This was our second stay at the Best Western Sandman and we were not disappointed. Our room was clean, quiet, and comfortable and there were several hot items in the above average breakfast buffet. We did not experience any problems. Perhaps a more comfortable chair in the room would have been nice, but the desk chair was adequate. There is no elevator, so if you have lots of heavy luggage ask for a room on the first floor. We will be staying at the Sandman again next month. "Best Western by name but not by service." We booked 3 rooms at the Best Western through a well known "booking" agency, same process used for the other accommodation bookings on our trip (no problems). Unfortunately on arrival were advised by reception staff they had booking for only one room and due to there being a major Jazz festival on at nearby Old Town they did not have the other rooms available. Inquiries seemed to indicate an issue between the booking agency and BW's system resulting in the error. The reception staff were friendly and approachable and did make attempts to contact the booking agency to determine where this problem occurred but were unable to get any response - big negative for that service. The duty manager was then alerted to the dilemma and came out to see what could be done. After some discussion it appeared they may be able to supply a second room only, which meant two couples bunking up in one room - not ideal given the booking was made months in advance. The manager then took it upon himself to waltz off somewhere leaving the counter staff to deal with the situation. A quick walk to a couple of the nearby hotels found a possible solution from hotel management that were more interested in customer relations and securing an additional 3 room rental for 2 nights. After some deliberation we opted for that alternative and went down to the Days Inn, which proved to be a good choice as we were very happy with the stay, even if it cost us a little above our room rate with BW and Days Inn's usual online rate - but beggars can't be too choosy. The biggest disappointment with BW was the lack of any real interest or effort on the part of the duty manager to step up and at least make some genuine effort to manage the situation, there was no phone call to the other BW's in sacramento to see if they could assist or to any other hotel for that matter. It was a wash your hands scenario - and sort it out yourselves. Can't fault the staff on counter/reception nor can I point the finger directly at BW for the stuff up. Have used BW on many occasions in Australia and also found to be on the better end of the hotel/motel chain offerings - sadly not in this case. 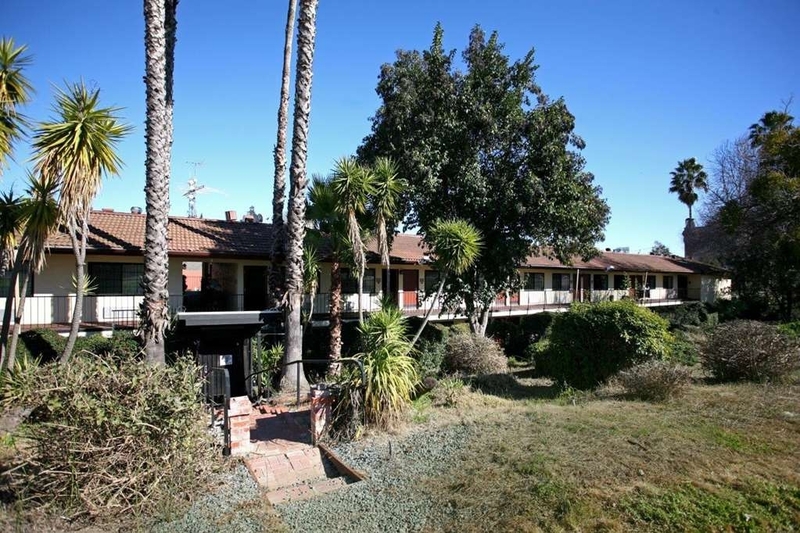 Comfortable and clean older property, well-located to all areas of Sacramento, particularly Old Town and the river. Near a rough neighborhood, but never felt any trouble. Pet Friendly was a huge reason why we stayed here. Great set-up to bring your dog. We had a second story king room with pull out sleeper and balcony. No view but quiet. The room also had a flat screen tv, microwave and refrigerator. The bed was comfortable with good quality sheets. The reception was friendly and helpful. They offer a shuttle to Old Sacemento, but it's a walkable distance along the river walk. (Uber to Capitol mall is under 4 bucks). Nice place to stay easy access on and off I 5. "Nope -- fleas, bad mattress, bad service." Although this property is in a good location and part of a usually reputable chain, it should be avoided. Fleas. After waking up with itches I noticed fleas in the bathroom sink and more fleas congregating in the corner of the bathroom ceiling. I also woke up with an aching back after sleeping on an old mattress. I usually don't comment on service but I will in this instance. At check-in I had to wait in line to check in -- while one employee handled an existing customer in front of me the other employee at the front desk took a personal phone call. Once I did check in I had to ask for the Internet password when it should've just been offered as a matter of course. Lastly, because I wasn't feeling well at check-in I didn't ask about breakfast arrangements for the morning, and the front desk clerk didn't offer any information either. The next morning I woke up late (still feeling sick) and missed breakfast entirely because I didn't realize it ended at 9:30, and I didn't know where it was either. No way will I stay here again, nor recommend anyone else stay here. "Kind staff - comfortable bed - HOT breakfast!!" This hotel is very clean and the beds are very comfortable. We were surprised by the hot breakfast. Also, the staff goes out of their way for you. You must stay here if you are in the Sacramento area!! "Excessive Taxes (hospitality Tax of $12.96) & ( Tourism Assessment of $3.24)"
The room was fine. Make sure you inquire about the additional fees that are added on. The motel was supposed to be on the River, but it was quite a walk and you could not see it from the hotel. The breakfast was had a lot of good options. This motel was the only motel that we stayed that had these charges. Overall our stay was excellent. All of the staff and manager were very helpful and answered all our questions very quickly. The breakfast area was very clean and food was very good. Our room was large and very clean. "Walk The River to Old Town Sacramento!" We had a wonderful stay at the Best Western Sandman Hotel! Angie, the front desk receptionist greeted us with the big smile and had all our check-in paperwork done in no time. Since we had arrived much earlier than regular check-in time, she had a wonderful suggestion for us. She issued us a key that allowed us to exit the rear of the complex and join the walking path/bike path. We walked to Old Town Sacramento along the river. We exited the walking path where the California Locomotive Museum is located. We enjoyed some of the sites, and walked about 10 minutes to the State Capital. We took a tour of the Stanford House Mansion, and several other sites. When we returned to the Sandman, they gave us our room keys, handed us our passes for breakfast the next morning, and we went directly to our room to relax. Our room was very clean and spacious. It was equipped with everything from a hair dryer to a refrigerator. One amenity we especially liked was the special television remote that was specially designed to be cleaned and sanitized easily. Our room was very quiet and the bed was comfortable. When we woke up the next day, we enjoyed a nice breakfast of omelets, bacon, sausage, homemade waffles, fresh fruit, and other goodies. The coffee was fresh and very hot. A great, simple way to start the day's journey to see more sites We are looking forward to visiting Sacramento again soon. 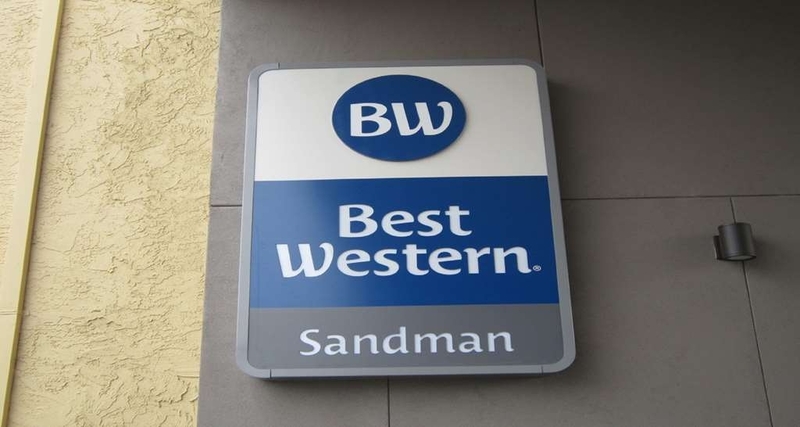 When we do, we will be staying at the Best Western Sandman. Although we did not travel with our dogs on this trip, we were thrilled to learn that the Sandman is pet friendly. Many thanks to the Angie, Linda, and the wonderful staff for making our stay superb! Beds are comfortable! Amenities include, coffee maker, microwave, small refrigerator, internet and HBO. 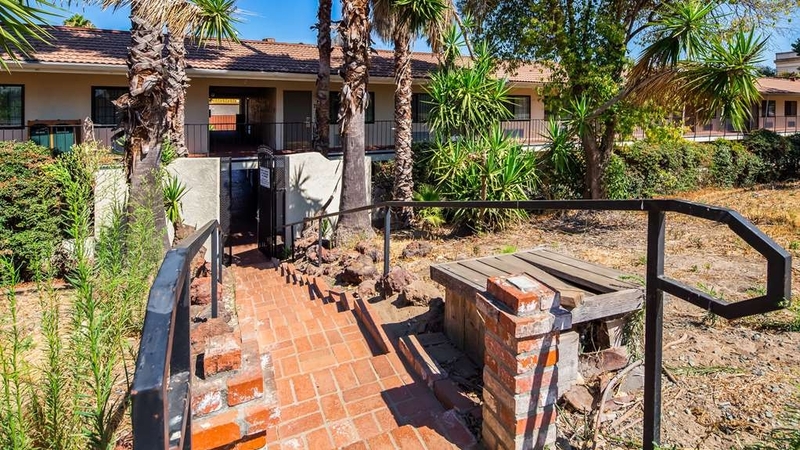 This location is close to the freeway for convenient access, has an outdoor pool and Jacuzzi, fitness center and guest entrance to the river. 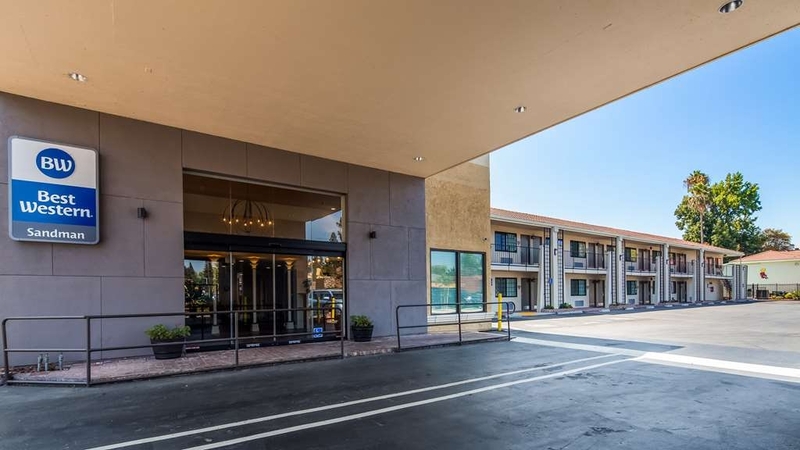 "Pet friendly and people friendly stay"
This Best Western is right off the 5 freeway, next to several gas stations. Perfect for a overnight stay during a road trip. It also has a small pet area (with bags) and river access. There was a walking path near the river that was perfect for exercising my dogs. The staff was very friendly and went out of their way to make sure our stay was enjoyable. Very happy with this hotel. The room actually had a view of the riverwalk! Comfortable bed and room, nice breakfast, and very helpful staff. This is my second stay for business and I will definitely stay again. "Above-average motel, just not the nicest neighborhood"
This motel was very clean and had a good-sized room. 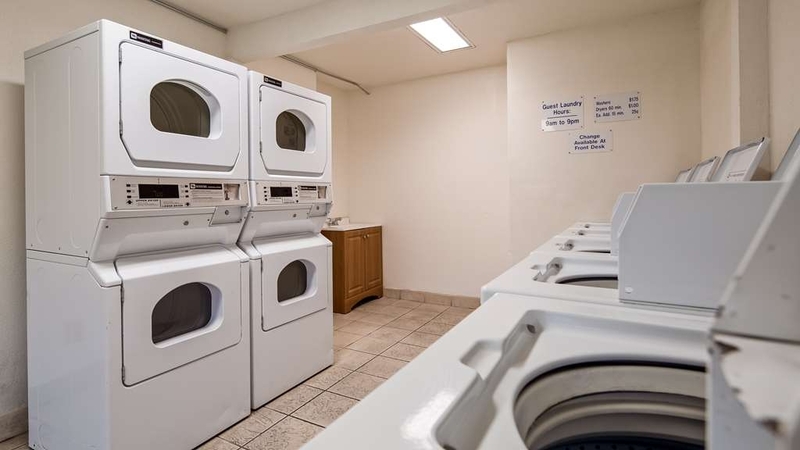 It has a small, but serviceable fitness center, and has a laundromat room onsite. The staff were generally very pleasant. I was also pleased that the motel offered a shuttle service (airport, train station, or convention center), so it was convenient to get to and from our downtown meetings. 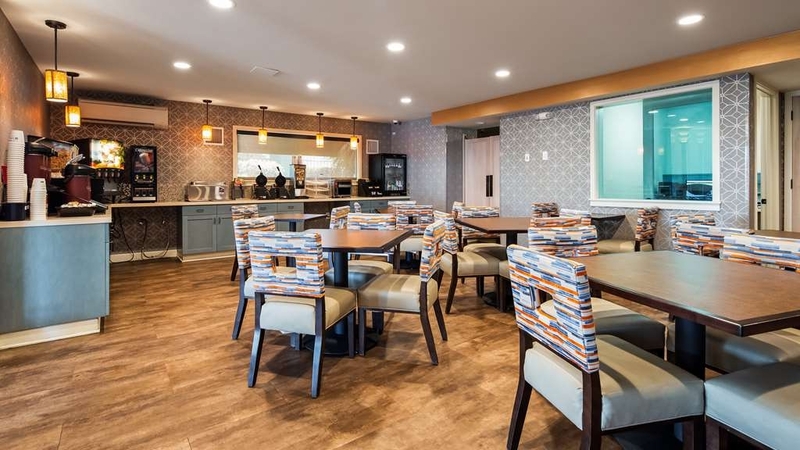 I agree with other reviewers who said this motel is in a "food desert." There is only one restaurant nearby. But since there is a fridge and microwave in each room, at least you can bring your own snacks. There were a lot of transient folks nearby, which was off-putting to some people in my group, especially with the open-air walkways. You can also hear noise from the highway, so ask for a room facing the river for a bit more peace. Very quiet and comfortable with great service. Also a fantastic hotel for staying with your pooch. The secure gates out of the back of the hotel access the bike trail along the American River. My dog and I took several long walks out there, and it was absolutely beautiful. My dog also loved it. She was just as happy to stay here as I was. They also didn't treat me in any way as a second class citizen because of the fact that I was traveling with my dog. We booked two hotel rooms and some how made a mistake by only requesting one bed in each room. The manager was completely understanding and upgraded us for free on both rooms. The customer service was amazing! The Sandman Hotel in Sacramento was excellent. Good price and a great hot breakfast which is a pretty good value. Close to downtown Sacramento, my wife and I visited the capital just a few minutes after leaving the hotel. Plus there is a pretty nice river path just behind the hotel which your key card will grant you access. Be sure to ask for a room on the backside of the hotel so you don't have to be close to the I-5. Lastly the hotel is pet friendly as well. Check-in staff was very disappointing, having closed the lobby for more than 15 minutes leaving me and my son wondering if she had been taken hostage or murdered! That on top of her inability to properly program room keys made a 5 minute check-in process a more than 30 minute ordeal after parking my car!! While the bed was incredibly comfortable, it wasn't enough to take away the poor check-in experience and the broken microwave and ants in the bathroom when I woke up. The Sandman in Sacramento is a nice, clean and friendly hotel. I enjoy staying here because it has access to the trail behind the hotel and love walking to Old Sacramento from my hotel. 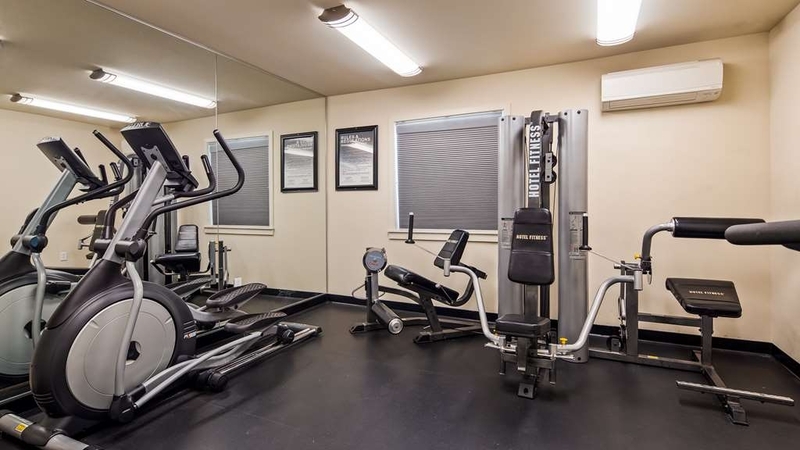 It offers a free continental breakfast and a small fitness center as well. "Easy I-5 Access, Comfy Room"
Quick access to/from I-5, comfy bed in a fairly large room. Our room backed on the river walk, very quiet. Loved the ironing board cupboard on the wall. Only one restaurant within walking distance, Mexican cuisine, which shares same parking lot as the hotel. We weren't in the mood for Mexican, so ordered their hamburger and fries and were pleasantly surprised with how tasty our meal was. There was higher than usual security (the lobby was locked upon our arrival but the lone woman manning the desk buzzed us in. Plus the breakfast room which was located in another wing of the hotel had to be opened with the room key), I was both impressed with this but also concerned what sort of area the hotel was located in. The internet was really good, but not secured. Close to several gas stations. We would definitely stay here again. We stayed one night based on the other positive reviews. We weren't disappointed. This is a very good pet friendly hotel in Sacramento. Room, breakfast and all the staff were very good. The easy access to the River Walk to walk your dog is a real bonus. The room was very quiet and dark for a good nights sleep. Will definitely stay here on any future trips to Sacramento. "Our stay for the State Basketball Finals"
This hotel was close to the "SleepTrain Arena" where the Finals for the California High School Basketball where. It is close to everything in Sacramento. It is an older hotel, but well kept up. The staff was great to work with. Great breakfast room. I would stay here again. "hotel a bit tired, could use some work, but our stay was ok"
One nite stay on our travels down I 5. Friendly staff, but ambience somewhat marred by all the huge trucks in the parking lot - it seems to be some sort of staging area for newly manufactured truck tractors. Room was ok, clean, but the whole place is a bit tired feeling and could use some updating. Breakfast was fine. Hotel is VERY close to the interstate, so you might want to get a room facing away from the freeway. Mexican restaurant nearby was excellent. The rooms are clean and comfortable, and the staff are very friendly and helpful. I was most impressed with the breakfast they offer. We've stayed at more luxurious hotels that didn't offer such a comprehensive breakfast! I travel with children so being able to grab a satisfying meal before checking-out and hitting the road is a definite plus! We even managed to take advantage of their pool and hot tub--it's nice to let the kids blow off some steam after sitting in the car all day. It's right off the highway and very easy to find. Next door to several gas stations so you can fill up before jumping back on the road. Perfect! "Pet friendly for large dogs"
Needed a place to accommodate a golden retriever. Hotel very pet friendly and loved the location on the river walk. Even though we only spent one night we did a lot and had our "furry" family member with us to enjoy our trip that much more. We stay here for years because it is mid-way in our trips in California. Quick off-on to freeway. Best breakfast of all Best Westerns I've been to. Adjacent to downtown and Old Town. Staff very helpful. Limited handy cap parking. A very enjoyable stay. Wonderful staff.wonderful river access. Very nice amenities. This BW welcomes pets and the entire staff are animal lovers. Makes a great difference! I highly recommend this location. It's 2 miles from dwntwn Sac and beautiful Mid town and all it's fine restaurants. Staying here right now for two nights to attend a vintage trailer repair clinic in Sacramento. Ultra clean room with many deluxe touches. Super comfy queen beds, nice amenities, beautiful shower in tub with adjustable shower head. Love the shiny, clean fixtures and the two soap holders, high and low. It's the little details like that that count. Letting us check in a bit early. 1:30, on a very rainy day will guarantee a future visit from us! Last motel we stayed at in Bakersfield, will not mention the chain, our shoes stuck to the carpet. This place is fantastic. Nothing impressive about the exterior, the Mexican restaurant next door is good, but the room, 228, was lovely. Right on the Sacramento River, view rooms available. "Out by the river there is a great hotel!" From the moment I entered the lobby to when I left for the airport I had a very comfortable and great stay. The staff were all smiles and the housekeeping exceeded my expectations. The breakfast was decent enough and WIFI was strong. Wasn't expecting much when I drove up, but was impressed at the end of my stay. "Very good place to stay in Sacramento"
My wife and I were looking for a place to stay in Sacramento for a couple of nights, and I don't usually look at this area, but I decided to give it a try given the overall good reviews. This is indeed a very good place to stay. Close to Sacramento but not expensive. Our room was nice and away from I-5 (quiet), clean, although a little dated. Internet, parking and breakfast are free. The lady at the reception was very friendly. Overall, a good place to stay. I was very happy with my stay at this motel. The staff were very attentive, the rooms were nice and clean. I stayed two nights and rested well. the restaurant next to it was a fantastic Mexican food place. Home made everything. So good !!! We really enjoyed our stay! This was a nice place to stay, the room was clean and was a really great set up for our large group. we had 5 kids and the room was big enough for them to run around and play! It was great. If you are a woman travelling alone, do not stay here. Skechy area, people looking in on your room at the ground level, and back area (rooms in the quieter section next to the river) not safe. The room smelled funny, like bad smells of something smelly covered up by lysol like strong detergent. The chair in my room had a nasty big stain, where it seemed like someone (a baby perhaps?) was put down with a wet diaper, and the thing smelled like urine. Serious upgrade needed here. Stay closer to town too--this is far from the center of town. "No real negatives, just average"
I stayed here for one night because my usual downtown lodging was unavailable. It was only minutes away though. The room was decent, everything was clean and functional. The staff was fine. It's right off the freeway so a room in the back is preferable. In the back is the river and a walking path. The immediate area is motels and gas stations. The Mexican restaurant next door is good. Breakfast was fine, the coffee was weak. I would stay again in a pinch. The room was clean, internet was fast and the staff was friendly and helpful. Location is great and I enjoyed the access to Discovery Park. I am never one for the pre-made omelets and sausage. However the breakfast was as expected. Overall, a great value. The hotel is within walking distance to Old Town Sacramento. They have a river access, which connects to a beautiful river walk. This is a nice place where the staff are both helpful and friendly. Fish. "We love the Best Western Sandman Motel!" I chose this hotel for its nightlife location to old sac. I had no idea it was dog friendly, LOVE! had a little hick up with a rude neighbor, but the lady at desk fixed it. I will definitely use this location from now on for work, so I can bring my dog with me. Having stayed at this facility before, I was not disappointed with my stay. Clean, comfortable, affordable . The location is close to where I have to work and the drive is short. The breakfast was ready and tasted good. The hotel needs an upgrade to meet todays standards. Good location, clean but shopworn. Good breakfast and access to walking/jogging path. Adequate parking. Quiet if you are on the backside. Stayed here for years and never had any problems. We recently stayed at this BW during a long relocation trip. The location was easy to find and very convenient to restaurants and gas. Parking was plentiful for our cars and moving truck. The staff were friendly and talkative the moment I walked in, which I greatly appreciated. Our double room was clean and spacious and located in the back row of rooms facing the river. Although we couldn't see the river, there was guest-only access next to our room which we took advantage of the next morning. We had zero issues with the room or services. Pros: Clean and spacious rooms, very friendly staff, guest-only river access, complimentary breakfast, decent Mexican restaurant walking distance Cons: None, although I will say that the location may not appeal to fussy, high maintenance travelers. We did see a few questionable looking individuals hanging around much like any area that is mostly motels/hotels. "Cheap and still not a good value"
We paid $86 for a room with 2 queen beds. Seemed like a good value, but the beds were not very comfortable and the room was exceptionally noisy. We barely slept. 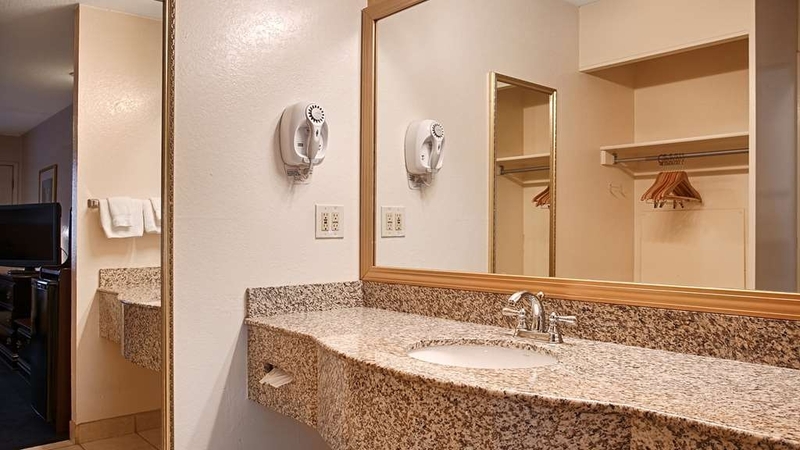 I also did not like the fact that the sink/mirror are in the room, not in the bathroom. You cannot get ready in the morning without waking up your traveling partner. The Mexican restaurant next door is cheap, fast and has bland food. Your call on whether it is worthwhile to try. The neighborhood this hotel is in is not good. Staying right by the highway is always an indicator that you are in for a lower level of quality, but we saw 2-3 homeless people and 2 obvious drug addicts out front. No problems, but the street is shady, so know you are not going to be taking a walk at night like you would if you stayed downtown. The staff was great, too bad the hotel is overall just not built for anyone who wants something beyond a tree house level of comfort. We stayed here overnight on a trip from OR to Southern CA. The room was quite large and had a private fenced-in patio area. I really liked that this "family" room as they call it had a King bed and a Queen bed. That is really hard to find. The water pressure in the shower was fantastic. The doors slamming from other guests was a real problem, though it is hard to blame that on the hotel, I guess. The front desk folks were very efficient and friendly. The room was clean but really cold. The temp was set to 58 when we arrived. I set it to 65 before we left for dinner and when we came back it was only at 62. I froze all night long which is odd because I like it pretty cold when I sleep. There were no comforters, just a single very thin blanket sandwiched between 2 flat sheets. I suppose I could have called in the middle of the night for extra blankets, but I thought the heater would be sufficient given some time. It was not. Overall it was decent and clean, but just average in my opinion. The free breakfast was decent. Quite a lot of choices including "omelettes" and sausage, bagels, yogurt, cereal, pastries, waffles, fruit, juice & coffee. The eggs I had were still cold. The room and adjacent seating area are small so it was difficult to maneuver when it was busy. Staff is great and pleasant when you arrive. Check-in is quick. The rooms are spacious, and the breakfast in the morning is very good. It's only a short walk to Old Sacramento along the river. So I'm recommending that you give this place a try. You won't be disappointed. I stayed here for 3 nights recently. I was surprised how nice the room was after not actually liking the exterior look of the hotel and its location next to the I-5 freeway. The room had a sofa, fridge, microwave and a king sized bed. A nice room for the price. It wasn't as actually loud from the freeway noise as I had expected which was surprising. Fan and air conditioning worked very well too, which is one of my pet peeves about staying in some hotel rooms. Staff was very nice. Not a great location if you have business near the Capitol though. You have to drive there, you cannot walk. It was a dark, cold and rainy night. It had been a long day behind the wheel and I could have been in a better mood but the gal who checked me in at the Sandman was so pleasant and cordial it set the mod for what was a very nice stay. The room was neat and clean and the beds were very comfortable. The next time we're in the area...we'll stay at the the Sandman again. I stay with the BW Sandman weekly. I'm pleased to return time after time. Everything is always spotless and the staff are very welcoming. I sleep better than at home because the Sandman has very comfy mattresses. Top of my list of satisfying features is the QUIET, I sleep peacefully on every visit. I even overslept this morning, whoops. It's conveniently located for business or pleasure visits to Sacramento. It is my home away from home and the only place I'll stay in Sac. Short walk to Old Sacramento - great location for New Years. Hotel is dated, but if you re not going to be inside all tht much, works out ok. BW breakfast is on the low end - standard waffle level and the breakfast room is crowded. I generally stay at nicer hotels, but I was very pleasantly surprised by the room, the location, & the staff. We had a nice stay & enjoyed the access to the Riverwalk which is included. We were able to walk down the path & watch the New Year's fireworks on the bridge down river with no one else around. It was very romantic! I love this hotel. I love the location, and the service. I always enjoy seeing Old sac, and enjoying the close convent walk to the river to watch people fish and or boats on the river, its very relaxing and I will be back again very soon. Clean comfortable rooms, with plenty of free parking. A good price and good location to access many parts of Sacramento easily with a short drive. It is also very close to Old Town, and also has a locked gate to access the river walk/bike trail. Very nice for a relaxing walk, and access to the big park along the river. A short, fairly easy drive to the expo center, and a real short drive to Old Town Sacramento. A decent pool and hot tub area if you like that kind of thing. The free breakfast room is a bit cramped, but a place to grab a quick bite before heading out. The TV and channel selections are not the best, but then I don't go to my room to watch TV. I was impressed with the ease of access and the good speed on their in room wifi, but I wasn't streaming video, just email. Have always had a good experience at this hotel over the past 9 years. Have not experienced any significant problems. A little bit pricey. Quiet and comfortable rooms and very central location. A good line of amenities and not usually crowded at Christmas time. The co-located restaurant is acceptable. The staff was very friendly and accommodating. The guests kept using their keys to lock and unlock the cars which caused them to honk while parked next to your room. The restaurant had terrible service. No alcohol was available. Forgot to bring Tortilla's with the meal. I'm not sure the restaurant was part of the motel. Had to find another server to get the bill for the meal. This hotel is a great place to stay when I'm working in Sacramento. I think the people are great, friendly and helpful. Also the hotel is quite and I like that a lot. I stay here often....at least 10 times a month. It's easy to get to from the freeway and near everything. "On the river, close to Old Town, super clean." Friendly staff really matters to me because I travel alone, and bring along my dog. I feel welcome here. Clean room, good breakfast, easy access to Sacramento highlights,very comfortable bed, and plenty of amenities. And the price is a super great deal! Since traveling with our young granddaughter to Southern California for work and visiting relatives, we decided to stay at the sandman Hotel since it was only 10 minutes from the Sacramento airport. We received an early check in, were able to visit Old Town Sacramento, and have dinner in town, then awoke well rested for an easy drive to the airport. Very nice accommodations, and convenient location make this a great jump off point when flying out of Sacramento. "Helpful staff, clean and quiet room... I'll be back"
I made a reservation here for a conference at the Convention Center since all the other closer motels were already booked. Its about five minutes or more away from convention center but easy on and off the interstate. I had some containers shipped to the hotel which arrived three days before my visit. They held them and acted like it wasn't an issue (which I appreciated). Checking in was super pleasant with the gal on shift, room had a slight odor when I first walked in... but I didn't notice it again the three days I was there. Spacious rooms with a couch. I had a room on the top floor and facing the river and it was very quiet. I happened to be near the middle of the building which may have prevented a lot of passerby's at night. Overall, I paid about ~93 a night and it was cheaper than any other closer convention center room I looked at. This is not luxury but was adequate for a couple of days lodging away from home, and it was pretty clean. While this isn't the best hotel I've ever stayed at; it was a very well run hotel that I would be happy to stay at again. Very nice hotel, close to freeway so it's easy to get around, breakfast is good. This is the second best western sandman I've stayed in and have not been disappointed. Room very clean, beds really comfy. This was a nice hotel, real easy getting to and from everywhere we needed to be. The breakfast was good, room was clean and the beds were comfortable. I would stay here again when in the area. We stayed on the back side of the hotel very quite. Parking wasn't a problem, There's a Mexican Restaurant which looked like it might have good food but we just went on a Food Tour and wasn't hungry. Would try it next time. "A Place to Spend the Night"
This is a dated facility. The beds were clean and the desk staff were absolutely the best. The room was not offensive but not super clean. Two queens, a large sink area, separate toilet and bathtub/shower area. The hot tub was broken. The breakfast was plentiful and the area clean. Some highway noise but not tooo bad. In an area with many other motels. Reasonable price for a safe place to stay. My son and I were traveling home from Washington, I checked on line for a dog friendly hotel, I called and made reservations as we were driving into Sacramento. We checked in late, around 9pm, the manager checked us in, he was very nice and helpful. We got a room in the back, room 151, it was just fine. Beds were comfortable and it was quiet, well except for the people upstairs...they were walking like elephants....it was pretty annoying. We left before breakfast was served. If we are in the area again and have our dog, we will definitely stay here again. This hotel feels like a chip aged motel. I got a smelly room that did not seem to be cleaned well. Someone moved in at 2am in the room above me and I can't sleep after that. The noise from squeaky floor and bathroom water was way too loud for me to fall asleep. The service staff was not friendly and they don't seem to be happy there. This was my first stay at a Best Western. The front desk staff was friendly, helpful, and prompt at checking me in. The room was bigger than I thought it would be for having a single queen bed in the room. It was clean, comfortable, and had a sitting area with 2 chairs and a table. Coffee pot, fridge and microwave. I would refer Best Western to all. This boring, functional motel is just off a highway ramp. It's surrounded by other motels and parking lots in an area with no character. The worst part of the experience was an 18-wheeler truck that they let park on the property --- and directly outside my bedroom window! It ran its loud engines for most of the night. Also, the neighboring room's extremely loud, ratting air conditioning unit was unbearable. Although we asked for another room, they had none to offer (neither did the hotel next door). Avoid rooms 131-134 and 236-239 if you want any sleep. Breakfast room was tight, noisy and very pushy due to overcrowded room. The food wasn't even that great. On the plus side, they gave us a few Best Western Rewards program points for our hassle, but I still would have preferred to sleep. If you must stay here, ask for a room overlooking the river, Rooms 241-260. Bad: VERY NOISY. If you stay here, make sure you request the back side of motel. Staff unfriendly and unprofessional. I personnally got the impression from the staff (by nonverbal cues and facial expression) that since I checked in early that they gave me the worst room and noisiest room in the motel. Right next to stairs. We did not get maid service because somehow after we left the do not disturb sign got put out. Upon leaving this morning, the manager said if I give the hotel a 10/10 on a survey, he would give me extra points on our rewards. Talk about bribery and vindictive. 5000 pts is not worth a 10/10. Good: Clean room. Great lighting. Comfortable beds and pillows. Good water pressure. Complaint about tub not draining fixed in timely manner. fantastic room and staff are always helpful, manager is allways hands on , very helpful. the breakfast is delicious, they serve whole range where we can have a big meal intead of breakfast(just joking) sauacages are yummyThey have hot pool and spa which is open till late. When I drive down to AZ from WA and back, this is where I stay. Not every room is perfect, but it's always been a good stay. The staff have always been very welcoming when I come rolling in between 11pm-1am. If they could put a tall handicap toilet in room 137, it would be the perfect room for me. I'm 6ft, have had 4 back surgeries and suffer from fibromyalgia. The breakfast staff have always been nice as well. This trip I got to try the pumpkin spice batter for the waffle machine, and it was a wonderful surprise. And finally, even housekeeping have been helpful and kind. I had a beaded keychain that a friend made for me and it broke and the beads went everywhere in the parking lot. I couldn't bend my back to pick them up. I asked one of the staff if she could help me and she grabbed a broom and found every single bead! She used the broom to get the ones that rolled under the vehicles. WOW! It's an older Best Western, so please take that into consideration, but it's clean. Not all the beds are perfect for people like me, but I'm slowly discovering which ones are. And the waffle machines, beats the Holiday Inn Easybake pancake machine Hands Down! p.s. I hear the view is great, but I'm always getting back on the road as quick as I can, so I've never seen it. This hotel has access to a wonderful river walk. It is an excellent place to exercise dogs who have spent long stretches in a vehicle. The staff is incredibly helpful and friendly. They have many rooms where dogs and people can stay, and there are roomy compared to many other hotels I have stayed. Best Western makes travel easy. I always have a great experience when I stay at any of their hotels. The service is very friendly and they go out of their way to make the stay the most enjoyable. The rewards program is my favorite. I get more gift cards, free stays and savings than I ever have in any travel rewards program. Everything I do with Best Western is made simple, and that's what I like best. I enjoyed my stay. The hotel was beautiful and the beds were so comfortable. Also I love that there was fresh breakfast in the morning. I had a great room with a private balcony. Two king size beds and the room was big and spacey. I slept well through the night with no disruption. "Second visit didn't live up to first"
This time our room was heavily deodorized. We weren't able to get rid of it with all windows and doors open and running bathroom fan. The staff had difficulty finding our reservation. The shower did'nt work well. Location is excellent and price reasonable. Our family had 3 rooms. Pleasant surprise, since I was really looking for an expensive place to sleep prior to a half marathon the next day. Very clean, updated nice room-I have spent twice as much for a similar room in the same city. Just no fancy lobby or free cocktails. Breakfast was there, but nothing I wanted to eat. For the price, that was just fine with me. Nearby Mexican place was horrible-Do not eat there! I enjoy staying near the river. The breakfast is always fresh and plentiful. Hotel staff are always courteous and helpful. I enjoy the laid back atmosphere at the hotel. If I need a late check out they are accommodating. My stay was comfortable and clean. I was traveling with my cat so having the ability to bring him along without any extra charge was nice. The bed was comfortable and the noise level was low. I would recommend this establishment to others if asked. A little dated, but clean and spacious rooms. Ample parking and warm breakfast. Staff was very helpful. The motel is off the I-5 and Sacramento River. We had a room in the back on the Sacramento River. It was very quiet with secure access to the river trail. It was close to old Sacramento and the downtown capitol area. The access from I-5 is close, but a bit confusing. Motel was in a good location for food, gas, & access to highway. It was clean, spacious room, ample parking, and quality of breakfast was very good. Enjoyed having both mini fridge & microwave; also free wi-fi. "Flaunt it when you "got""
this is a used older Motel but it sits on the Sacramento River and has excellent walking trail. The morning sound of ducks and other river folks sounds....Loved the trip.....PS it has an excellent Mexican Restaurant and terrific staff. I would not stay at this hotel unless I had no other choice. It was gross all the way around. The walls were paper thin, the food was nasty, the service...well there was no service. Our room didn't start clean and didn't get clean later. TV was fuzzy. Couldn't get an extra blanket. Very disappointing! Clean, well appointed, caring staff made this a worthwhile hotel. Centrally located and convenient to freeway. This was just a short one-night stay, so we weren't able to take advantage of all the facilities, the pool or fitness center. "Good standard motel; comfy beds; continental breakfast with hot eggs and sausage"
Good bedding and nice TV. Easy access near the I-5 freeway; plenty of parking. The property has direct access to the riverside trail going to Old Town (~20 minute walk), however the trail is not lit at night, so use Uber to return after sunset (~$6). This property appears dated. However, the rooms are well equipped and spotlessly clean. The staff are very helpful. They served a hot breakfast in a small area that was kept attractively stocked and tidy. The hotel staff were nice and accommodating. The room was clean but a little outdated. The pool and hot tub were super warm and awesome to use. The breakfast had hot items, but was a little lacking. Overall, it was a great place to stay for the super cheap price I found online. Rooms have been updated. Clean and comfortable. Lots of pillows. Great breakfast room. Even offer cranberry juice. Convenient to "Old Town" Sacramento. When we checked in, they offered to upgrade us to a "balcony room" for no charge. It was very nice to be able to have our coffee out on the balcony in the morning and watch the joggers and bicyclists on the Sacramento River levee trail. "Very good hotel at the right price"
I stayed for a couple of nights with my 10 year old son as part of his birthday weekend and had a good time. Pros: *Nice breakfast bar with a good amount of variety including both a waffle and pancake maker. *Good sized room ( we got one with a queen and sofa bed ) * Tall shower head. This is a pet peeve of mine for most hotels. I'm 6 feet tall and hate stepping into a shower where the water hits my shoulder. The shower heads were tall enough for a comfortable shower. Cons: * The driveway get be a little tricky getting into and out of the main parking lot area. * The pool was a little small Overall, this was a very good hotel and someplace I would have no problem staying again. "Don't know where you are"
The directions on their website say to go left off the freeway but it is right. The employees do not know how to give directions(don't know their left from right, north from south, east from west) all they know is that you get off at exit 520. "Disney On Ice Dare To Dream show"
Clean facility, nice pool and hot tub. Breakfast was very good, with lots of choices. Friendly staff and comfortable room that featured artwork of the Sacramento area. Older facility, but renovations are good. Nice feature is the private gate to the walking paths along the Sacramento river. Nena's Restaurant next door had excellent food and the homemade tortillas are terrific. We will stay here again. "Nice area to stay but could hear people walking overhead late PM and early AM"
The Sandman is a nice location to stay at in Sacramento. It has a view of the American River. The walk into Old Sacramento along the river is a pleasant one The staff and services were fine, however we were awakened early in the morning and late at night when we heard load walking overhead. This was probably the most disappointing Best Western I have ever stayed in. Location is in a sketchy neighborhood. Check-in took a 30 mins. Exterior and interior both need to be updated. I was appalled at the appearance of the pet area. It's a shame that management payed no attention to the fact that the dog waste can was maxed out! Next time I'm in Sacramento my stay will not be at this Best Western. From the moment we check in at the lobby to the moment we checked out at the lobby we felt we weren't even staying at a hotel. Every employee had amazing customer service and made us feel right at home. If we are ever in the area again, we will be staying here. A+ visit! My husband and I spent one night at this hotel and found it very clean and the staff very friendly also the room was very quiet as we asked for a room at the back of the building. By mistake we booked a room with disable facility but at the hotel the receptionist gave us another room straight away . Definitely will return. 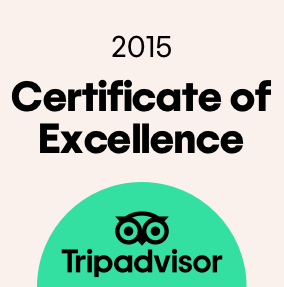 Have stayed here numerous times over the past 3 years and always had good experiences. HOWEVER, upon checking in yesterday, the young lady at the desk was very inexperienced and had limited English speaking skills. The rooms appear to be the same which are fine. Besides the front desk we were very disappointed to find the river walk behind the motel to be a homeless enclave. Previously my wife had been approached by panhandlers but now you can see their trash and camps. The day before we arrived there was a murder within 200 yards of the motel which we saw on the local news just after checking in! The continental breakfast is a joke, probably the worst we have encountered in recent travels. At 8:25 am a maid knocked on our door to make up the room! She said that there was no noise coming from the room and she thought it might be empty. All in all, we will be staying someplace else when traveling through Sacramento. If you need clean, friendly and reasonable in a downtown or near the airport location, this is it. Great people, updated rooms with polish and prices that make it affordable. 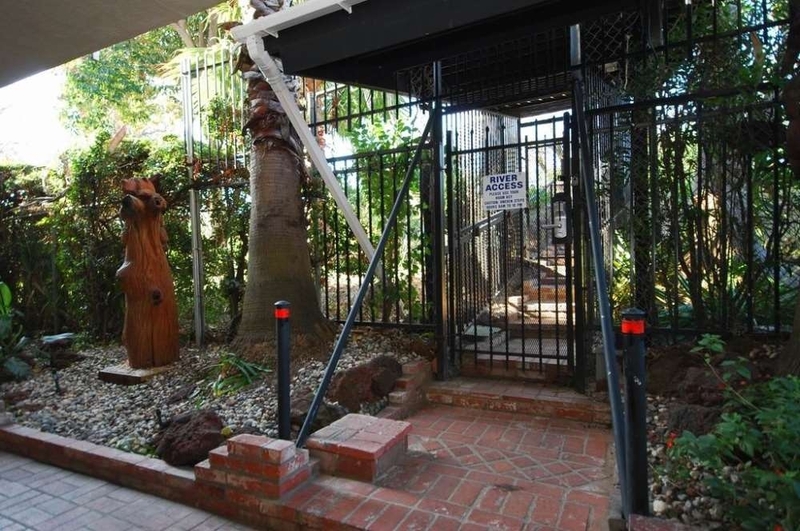 Access to the river paths just outside your door. "Hotel well worth the $"
No real complaints. Everything was fine. Maybe just overall ambience not quite there. Lots of cool stuff. Walk by river. Shower good. Shampoo and conditioner fine. Bed was great. AC worked well. Staff friendly and helpful. Could upgrade breakfast rooms. Spiff up the grounds a bit. Exterior cooridors could use some work as well. "Picking up new RV in Davis,CA"
We spent the night before we picked up our new RV in Davis,CA. They have a shuttle from the airport which was really nice. Staff was friendly. The unit was clean but very dated. Dinner was just a walk across the parking lot. We would stay there again. "Clean and convenient to I-5"
We picked this hotel out as we were driving at the end of the day. The GM was on duty and was kind enough to give us a nice room option as the hotel was about full. It was typical in decor and clean but you wouldn't want to make it your honeymoon suite. There was a Mexican Restaurant across the parking lot and the food was excellent and we carried back to the room. I would say that I would stay here in a pinch under the same circumstances but given the choice, I would have picked a higher end product to please my wife.....I need to quit being so cheap on these trips and start writing reviews of really nice places.......nothing bad to say about the accomodations. I checked in very later after 10:00 pm and I called in while I am on the road that man in front desk said it is oaky. The motel is very standard and clean also comfortable. It is close to high I-5 and has the door entry to American River Bike Trail. Also close to California State Railroad Museum. The breakfast was good and the girl was working around to make food keep warm. Hotel near enough to freeway to get back on the road but quiet enough to relax. Clean rooms with a good Mexican restaurant next door. Good breakfast room to help offset the cost of the room. Room has everything you need including free WiFi. Hotel cannot do anything with the area so you might see a lot of homeless hanging around. "A pleasant place in an interesting city"
We enjoyed coming back to this hotel as it was close to the Old Sacramento sites that we wanted to see. It was clean and cool and quiet. The access to the freeways was close and easily navigated. I would definitely stay here again. This was my first stay at this particular Best Western and I was very pleasantly surprised. The facility is very well located both from the standpoint of easy access from and to the freeway (I 5) and walking distance to Old Sac. The staff was very attentive, helpful and courteous. The room was comfortable, well cooled on a very hot day, and very quiet. The breakfast was hot and fresh, including nice cheese omelets. I would definitely stay here again. A very nice well maintained hotel. I would definitely stay here again. The Mexican Restaurant that was in the same parking lot was really good so once you check in you don't need to go anywhere else. The access to the walking/bike trail behind the hotel was great. The value of this hotel was perfect for my business stay. The staff was very friendly and helpful. The pool and spa were perfect. The bed was comfortable and the room was very clean. The rooms on the back side are quiet and comfortable. There would be to much noise on the front side. I was also please with the internet speed for email and surfing. I stay with my kids and I feel very safe and the rooms are always clean. I don't stay anywhere else. The manager is very courteous and helpful. He went out of his way to accommodate me and im very appreciative. the staff is very polite and respectful and they treat you like they have known you forever. The BW Sandman was a pleasant surprise. It is right off the I-5 and backs up onto the river. Every staff member we encountered tried very hard to make the visit a good one and answered all questions with a smile and good information. AND the parking lot is kept clean in an environmentally correct manner.